On the red carpet with David Oyelowo at the Miami International Film Festival with the film Default directed by Simon Brand. 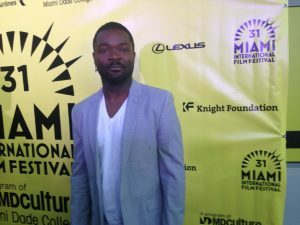 David Oyelowo (pronounced – “oh-yellow-oh”), a classically trained stage actor, has quickly become one of Hollywood’s most sought-after talents. He graduated from the London Academy of Music and Dramatic Art (LAMDA), and received the “Scholarship for Excellence” from Nicholas Hytner in 1998. David received numerous accolades for the recent independent film, Middle of Nowhere, which screened to rave reviews at last year’s Sundance and Toronto Film Festivals. The emotionally inspiring film portrays the universal dilemma of how a person maintains oneself as they commit to loving and supporting someone through hardship. David has received nominations for “Best Supporting Actor” for the 2013 Independent Spirit Awards and the 44th Annual NAACP Image Awards on behalf of his work in the film.